It’s a frequent scene: attendees sit waiting for a conference to begin, surrounded by others but sitting completely silently, without interacting with each other. The attendees aren’t sure how to break the ice, or might be tired of giving the typical elevator pitch multiple times. And even if they do make a few acquaintances, they’re easily forgotten by the next day. We’ve already seen great successes from this feature. For example, at a recent industry conference, 90% of 5,000 attendees participated in the icebreaker, and the organizers were thrilled to see a flood of conversation and connection happening throughout the event! Let’s see how this feature can benefit your event. People don’t always remember what was said, but they remember how things made them feel. Even if the feeling was a little joy about connecting over the same favorite animals, movies, or sports. And you can give your attendees such a joy at the beginning or prior to your event, making them feel they are welcomed by other people. This creative icebreaker for large groups of professionals can change their impression of your event. Finding ways to connect on a personal level can often feel difficult. It’s easy to fall into a rut where you ask about where someone’s work, where they’re from, or why they’re at the event – and not actually learn anything about who they are as people. After all, we are much more than what our LinkedIn pages describe! From CEOs to interns, anyone can join in on the fun and really get to know each other. Even for a serious business event, this conference icebreaker can help loosen unnecessary tension and lighten up before moving to discuss their businesses or event-related topics. It’s a very efficient and fun type of icebreaker for large groups of professionals. The icebreaker is not just a post for self-introduction. Perhaps another attendee finds that both have the same favorite place to travel, or they both enjoy the same sports. And they can post a reply to talking about it; and other attendees can easily join the conversation at the same time. In addition, the ability to respond with emoticons further adds personality to the process, reminding everyone that there’s a human being behind their event name tag! It’s a no pressure communication system that mimics social media – just respond with a smiley face and you’ll brighten someone’s day. Most of all, you don’t have to put in a ton of extra effort to offer conference icebreakers. You don’t have to come up with a new game that could make some introverts uncomfortable, or find ways encourage people to participate in the conference icebreaker. The Whova app triggers attendees’ curiosity, actions, and participation for you. 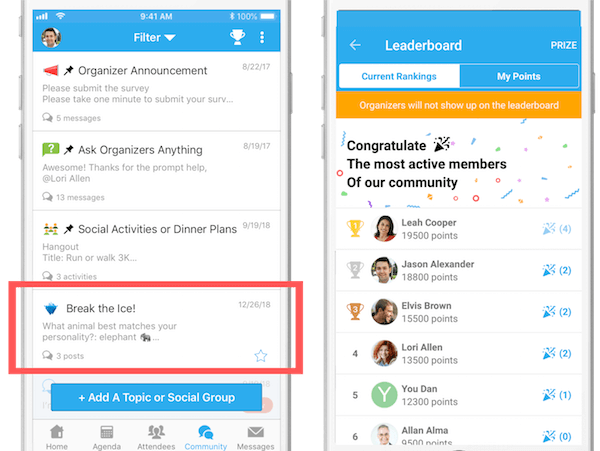 By integrating Whova’s leaderboard, attendees can earn points for engaging with others’ icebreaker questions. By gamifying this feature, everyone gets in on the fun with the icebreaker, while creating genuine connection along the way. What starts out as a race toward the finish line, ends up in a group bonding experience and chance to get to know others in the industry. 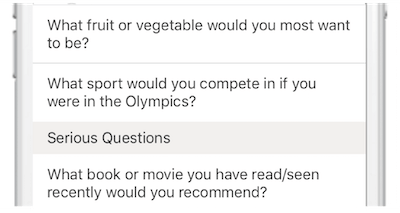 Consider two attendees waiting for their flights to a conference, where they connect with each other about the same favorite movie or sports. Once they arrive at the event, they can meet up, further find out mutual interests, and even create a social activity (e.g. dinner gatherings, ‘Morning yoga together’ ) to involve more attendees. The Whova app’s Community Board provides a central place for them to make memorable event interactions by themselves. And they will appreciate you for this unique experience they could have at your event! 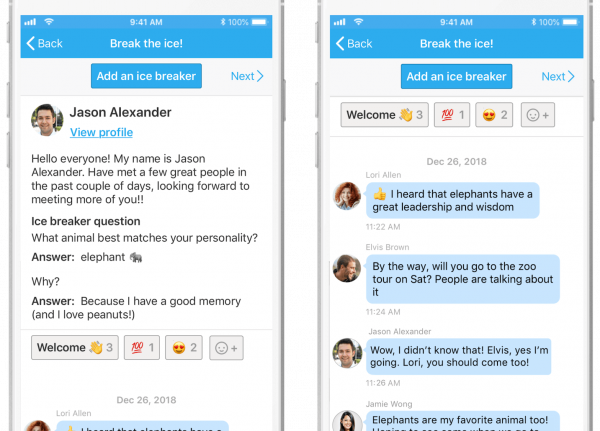 We’re particularly excited to bring this new icebreaker to event organizers, who are passionate to improve their events yet haven’t found an easy-to-execute, brilliant way. Now you can bring more smiles to your attendees and make them love your event (without your efforts)! Schedule a demo today to learn more about Whova’s engagement and networking solutions, plus time-saving event management tools.